Brining is a must-have technique for your grilling bag of tricks. 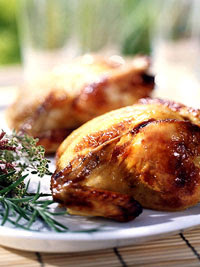 Try it out with tender, juicy game hens and you can't go wrong. Remove giblets from game hens, if present. Rinse hens. For brine, in a stainless-steel or enamel stock pot or plastic container combine cranberry juice, syrup, and salt; stir to dissolve salt. Carefully add game hens to brine. Cover and marinate in the refrigerator for 4 hours, turning hens occasionally. Remove game hens from brine; discard brine. Rinse hens and pat dry with paper towels. Tie drumsticks to tail with 100%-cotton kitchen string.Twist wing tips under back. Remove game hens from grill. Cover with foil and let stand for 10 minutes before carving. Makes 2 servings. Calories 807, Total Fat 45 g, Saturated Fat 12 g, Cholesterol 346 mg, Sodium 1180 mg, Carbohydrate 36 g, Fiber 0 g, Protein 59 g. Daily Values: Vitamin A 0%, Vitamin C 100%, Calcium 4%, Iron 14%. This entry was posted on 11:12 PM and is filed under Meat and Game . You can follow any responses to this entry through the RSS 2.0 feed. You can leave a response, or trackback from your own site.